At MARCELLO VERO, we offer only the highest-quality, most luxurious fabrics made in the world. The customer can choose from hundreds of fabrics, everything from traditional worsted wools, flannels and tweeds to super 150's, super 160's, super 180's, super 200's, super 220's, super 250's, 14 micron and 12.9 micron, fine silk, cottons, lines, millionaire cashmeres and guanaco. 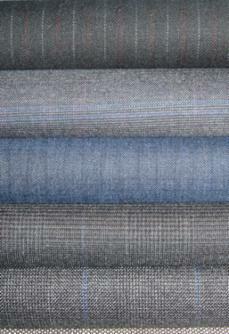 At MARCELLO VERO, you can also find cloths woven exclusively to its own requirements of weights, pattern and color. Browse through our samples here or make an appointment to come in to our New York Atelier to experience the fabrics in person.